"Mackey" and "Wild and Wooley Wes"
Joined the Sidekicks after the Cosmos folded on February 25, 1985. McLeod always wore white tassles on his socks for good luck. McLeod's #8 jersey was retired by the Sidekicks on January 24, 2004. McLeod set the final MISL record for most blocked shots in a season (154) during the 1989-90 season. McLeod also set the MISL record for most blocked shots in a Regular Season Game (14) on April 21, 1990. 1- only 4 of these minutes were while McLeod played for Dallas. The remainder were with the Cosmos. Intregal part of the "No-Score 4" penalty killing team that had a 69.9% effectivness that season. Also recorded two-4 game point scoring streaks (dates unknown) along with one-3 game streak and two-2 game streaks of the same. Scored the Game Winning Goal vs Wichita on January 21, 1986. Blocked Dave MacWiliams point-blank range shot in Game 4 of the Eastern Division Semifinals (vs Baltimore) with less than one minute to go that kept the score tied and sent the match to Overtime. Scored the Game Winning Goal on Opening Day (November 13, 1986) vs Chicago. Scored one goal vs. Los Angeles on December 12. Scored one goal vs. Tacoma on December 14. Scored his only Powerplay goal of the season on December 27, 1986 at Wichita. Scored the Sidekicks first goal of the game on March 6, 1987 at Baltimore. Scored an empty net-unassisted goal on April 4 at Wichita. Scored the final goal of the 1986-87 Regular Season for the the Sidekicks on May 2 at Los Angeles. Assisted on Tatu's goal in Game 1 of the Eastern Division Semifinals on May 7. Blocked Shot toal rose 230% (from 49 to 113) from last season. Scored a Shorthanded Goal vs Tacoma on March 1, 1988. Scored the Game Winning Goal vs Wichita on March 7, 1989. Passed Joe Waters on the All-Time MISL Blocked Shots leaders list. Anchored the '89-90 version of the "No Score Four" that killed 26 of the last 32 penalties the Sidekicks faced this season. Note: personal fouls were not an offical MISL statistic until the 1990-91 season. 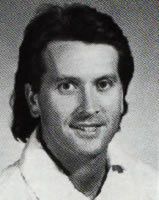 Wes McLeod announced his retirement at the Sidekicks final home playoff game in May of 1992 and returned to Tampa. He is currently a mortgage broker for Harborside Mortgage of Florida.